Lightweight and durable matte finish vinyl decal. Fits multiple Macbook models and laptops (see below for list). 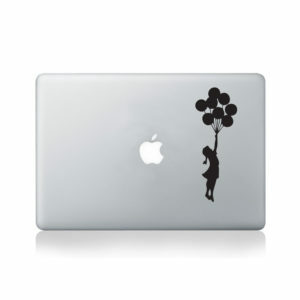 Premium vinyl decal for your Macbook or laptop. Designed by artists. Precision-cut by machines. Shipped in eco-friendly packaging straight from the source in Oxford, UK. Lightweight and durable vinyl decal. Fits Macbook Air (11-inch and 13-inch), Macbook Pro (13-inch and 15-inch), Macbook Pro Retina (13-inch and 15-inch) and Macbook Retina (12-inch). Fits all similar-sized laptops. Size of decal shown in product photo is on a 13-inch Macbook Pro. Made from long-lasting outdoor sign vinyl. Our special matte vinyl reduces glare caused by light reflections to achieve a stunning, paint-like effect on your surface. Made in Britain and protected by the Vinyl Revolution Quality Guarantee. How do you stick it? Quality materials means easy application. We’re amazed at what some people get away with when they sell vinyl decals online. From using cheap vinyl to selling products where you have to put the application tape on yourself, there are all kinds of things companies do to cut costs. Beware the dirt-cheap decal! You get what you pay for. Looking for a vinyl decal that looks great from all angles, lasts ages and doesn’t make you want to tear your hair out when you’re applying it? Well you’re in luck. This vinyl decal is made from the same premium stuff companies use to brand their cars and make their outdoor signs. Once your decal is applied, you can be sure it’s not going anywhere unless you want it to. This little guy will stick and just keep on sticking! Where can you stick it? Designed for Macbooks. Sticks anywhere you want. This vinyl decal fits Macbook Air (11-inch and 13-inch), Macbook Pro (13-inch and 15-inch), Macbook Pro Retina (13-inch and 15-inch) and Macbook Retina (12-inch). It fits all similar-sized laptops. It will stick to pretty much any smooth surface you can imagine. Metal, plastic, glass, wood. Laptops, cars, windows, guitars, drums, floors, ceilings, walls, fridges. The list goes on and on! Is your surface smooth? Then this vinyl decal will stick down and keep on sticking. Eco-friendly packaging designed to protect your decal in transit. Vinyl Revolution takes every step we can to reduce our environmental impact. This vinyl decal is shipped in a recycled, board-backed envelope with no plastic packaging whatsoever. This protects your vinyl sticker in transit and helps reduce our carbon footprint and means you don’t have to hassle with annoying plastic packaging. We ship anywhere in the world with great delivery times and free shipping on qualifying orders. Use the shipping calculator button above to check transit times and delivery costs for your destination. We’re a small business that prides itself on providing amazing customer service. Get in touch so we can help.